"'We will not allow any dancing...' In the brief respite after punk's first rush wore off and before Saturday Night Disco Fever properly set in, a number of groups, among them Cabaret Voltaire, Throbbing Gristle, The Pop Group, and 23 Skidoo, emerged from the shadows to occupy the middle ground. Though their tenure was mostly kept deliberately short, their impact was profound. "In Cabaret Voltaire's case, their early training as media guerillas vested them with the mobility to slip in and out of the mainstream earshot almost at will. As yet to be properly pinned down, they've sustained a campaign of civil and dancehall disobedience through more than 15 years. Filtering influences as diverse as Stockhausen, Can, early Roxy Music, Velvet Underground and James Brown through various tape and electronic devices, they have in turn infiltrated all manner of heresies and subversions into the often conservative territory of dance music. "Difficult to imagine, perhaps, but the scratch and break elements of hip hop and rap are partly rooted in the noise terrorism of Cabaret Voltaire, Throbbing Gristle et al. Even as they've moved far away from their original all out assaults, their tempestuous beginnings still inform everything they do. The importance of those early years should not be denied, for their great blasts of noise were instrumental in freeing popular music from its narrow, restrictive definitions. "With utmost precision and malicious glee, they completely shattered its harmonious appeal. Dirty, distorted noises dispersed beats and displaced melodies, barked vocals, as if through megaphones, competed with looped voices folded into the mix to disarming satiric effect. Movie screens extended the satirical range of their attack in their twining of atrocity and beauty, while at once de-emphasizing the cult of personality deemed necessary to the selling of pop. The death's head was a common emblem in this territory. It stood for the de-aesthetising of horror and the restoration of its full meaning. "On first exposure their bombardments were relentless and unending. But anyone left standing came to realise their dissonances were more than just dirt in the ear. Aside from the immense, invigorating pleasures of their transgressive noises, Cabaret Voltaire bravely forced new ways of listening. First of all, they unbalanced the equation of dance beats and body music. Through an excess of volume they could render the most intractable musical elements physical. "Once the rhythmic emphasis was shifted, and with it the more impatient listener's expectations of immediate gratification, they opened up a space where music could stop and think. This space is The Grey Area - the last refuge from the entertainment industry's relentless splattering of grey matter. In this space where ideas could breathe, they eroticised difficulty, introducing into and through music painful matters as suitable subjects for treatment. "Control, and how to confound or defeat it, was a recurring theme in their work. They simulated, parodied, satirised its manifestations, adapting the cut-up and fold-in experiments of William S. Burroughs and Brion Gysin for sound. They were among the first popular musicians to seriously use "found" soundbytes, lacerating recorded speeches of politicians, pornographers and slot TV preachers, juxtaposing them in odd configurations, not only for comic effect but also to reveal their true nature. "Through their montaging of attractions and hard facts, they discovered different approaches to and for rhythm. The way of montage led to a reconciliation with racing dance pulses. Once they started cutting voiced drop-ins to the beat, Cabaret Voltaire's mission became clear. 'We will not allow any dancing...' reiterated the Voice of America, and within seconds, waves of sound began to exert their irresistable tug, thereby nullifying the voice of control. "grey area: borderline topic not clearly dealt with by rules etc." "Initially a three piece, Richard H. Kirk, Stephen Mallinder and Chris Watson began by playing around with recorded sounds manipulated by basic reel-to-reel recorders in Sheffield in 1973. 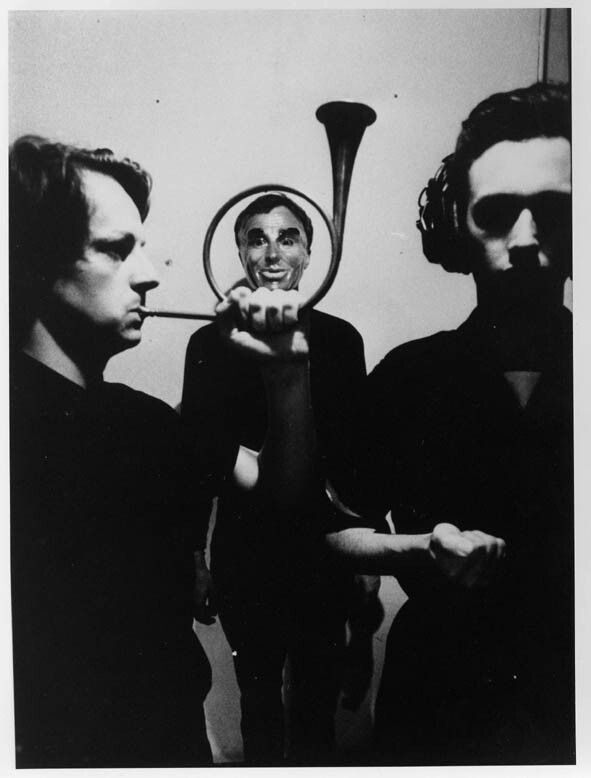 "Way ahead of their time, these ideas culminated in 1975, when the three staged their first performance of these sound experiments and assumed the name Cabaret Voltaire, taken from the name of the club started in Zurich by the principals of the Dada art movement during the First World War. "Noises were built up on tape loops and embellished with various instruments and processed and distorted voices to produce a dense percussive sound. The Cabaret Voltaire of 1973 to 1976 was purely involved in the manipulation of these sounds and the compilation of tapes of them. "As part of the confrontational energy of punk, itself inspired by the Dada and Situationist art movements, the early titles of the records didn't mince words - 'Baader Meinhof' and 'Do the Mussolini (Headkick)' were indicators that were bound to lead to a certain notoriety. To the press they appeared to be immersed in a world of paranoia fed by conspiracy theories, political control and the use of drugs to both free and inhibit the individual. "The band began working with Rough Trade in 1978, producing the now seminal triumvirate of albums, 'Mix Up' (1979), 'Voice of America' (1980) and their most prophetic album 'Red Mecca' (1981), an album released to an excellent response from the music press. All these recordings were assembled in the seclusion of the band's own studio in Sheffield called Western Works. "Chris Watson left the group in October 1981 on the eve of an international tour to pursue a career in television sound recording. This departure left Kirk and Mallinder free to commit to a long-term struggle with the 'pop music' industry under the protection of Stevo's Some Bizarre label, via a Virgin Records distribution deal. By December 1982 they were in the midst of recording the 'Crackdown' album in Trident Studios, London with the producer Flood, who went on to work with Depeche Mode and U2. 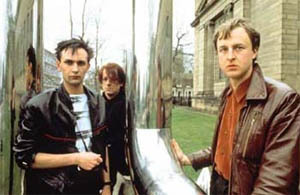 "Cabaret Voltaire were always strongly rooted in the Dada-ist tradition and nowhere was this more evident than in their rare but much anticipated live performances, with their innovative use of film and video documented in the three live albums, 'Live at the YMCA' (1979), 'Live at the Lyceum' (1981) and 'Hai' live in Japan (1982), and the 90 minute video 'Doublevision Presents...' (1982). "It is always difficult to assess any one group's influence in an area such as contemporary music. However, if nothing else, Cabaret Voltaire (along with Throbbing Gristle) were responsible for pioneering the acceptability and use of many sounds that would not have been considered anything to do with music in 1973. Particularly the use of 'found voices' that has always been a trademark of their material. They were also responsible for inspiring a number of groups who continue to work on the fringes of the music business and whose primary aims appear to be to widen the boundaries of 'music'. To this end, Cabaret Voltaire were instrumental in defining a strand of popular music which became known as experimental or 'industrial', whose practitioners Cabaret Voltaire moved on to leave far behind them."